Hey friends! 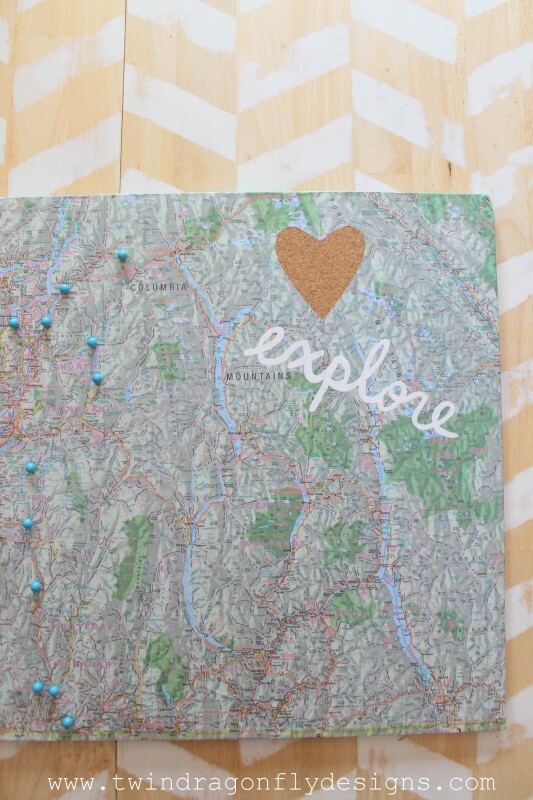 Today I am sharing a fun project that is perfect for families who love to travel or camp during the summer months. We are avid campers and stayed at eight different camp sites last year, enjoying the great outdoors! I wanted to find a way to show our boys where we had been and track our many road trips. 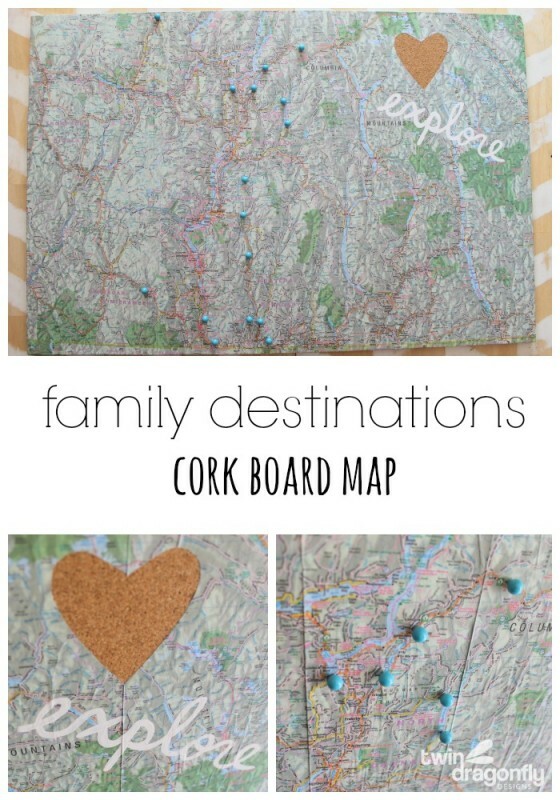 So I created this Family Destinations Cork Board Map and we have been planning our many adventures ever since. This is probably one of my most favorite summer projects to date! I love that our boys can now visually see where we have been on all of our family camping trips. We’ve been tracing the map together and reminiscing about some of our favorite spots. 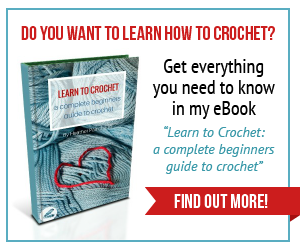 This is a fairly simple craft to put together. 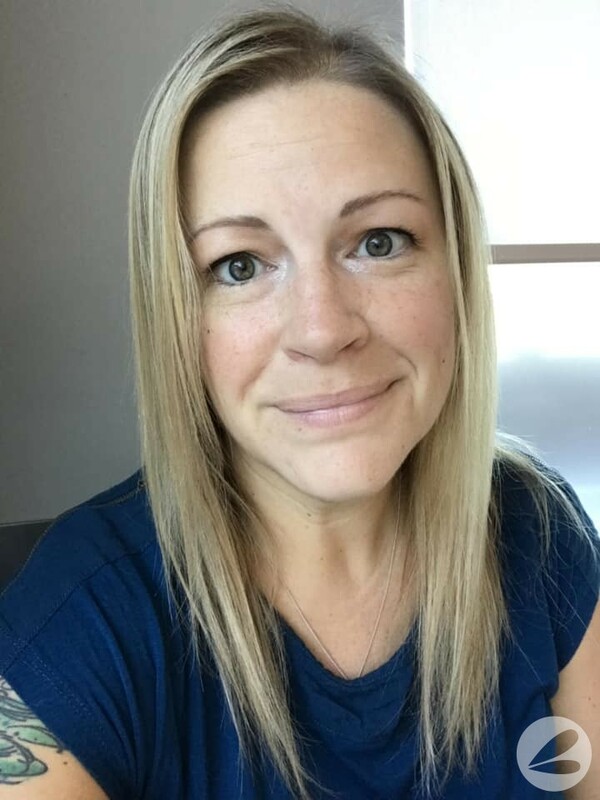 Let me show you how to make your own Family Destinations Map. 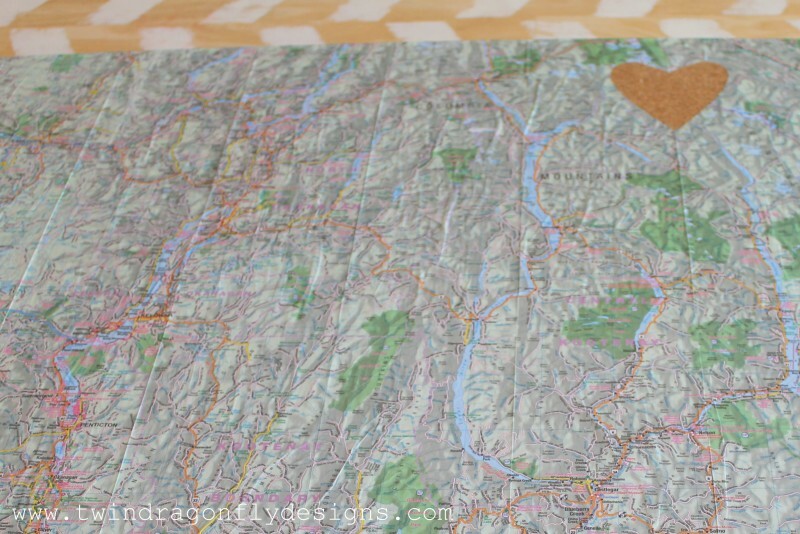 Choose a map that is larger than 16×20 in size. Use one that showcases where you and your family have travelled together. I chose this map of the Okanagan as we live in Kelowna, British Columbia and do most of our camping within three hours of driving from home. 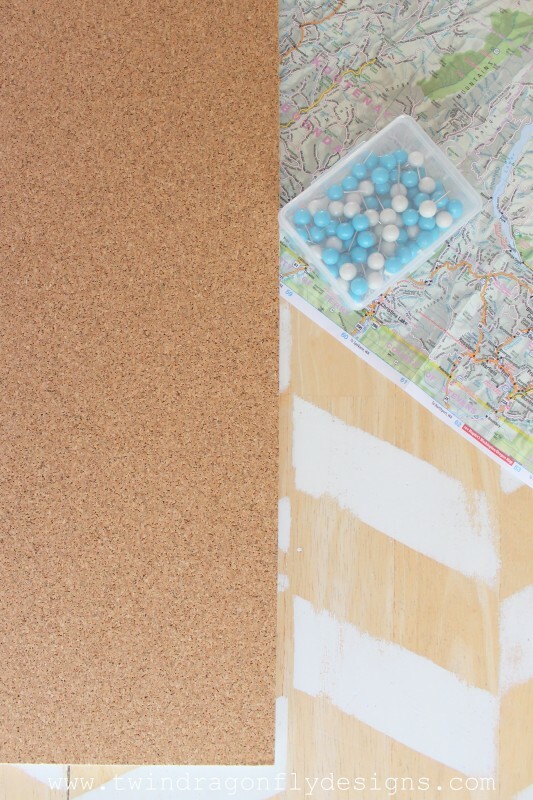 You may want to trim the map to the same size as your cork board or fold the excess map over the sides and affix the edges of the map to the back of the board. This cork foam board from Elmers is lightweight and durable, making it the perfect base for this project! Step 1 – lay the map over the board to make sure that it is the correct fit. Then cut a heart out in the top right section. 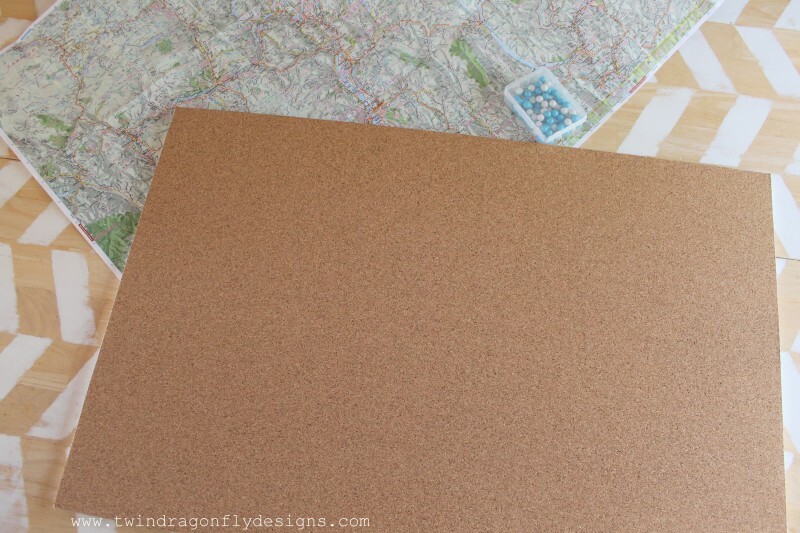 Step 2 – use the decoupage medium to glue the map to the cork board. Start at the bottom of the board and work your way to the top. 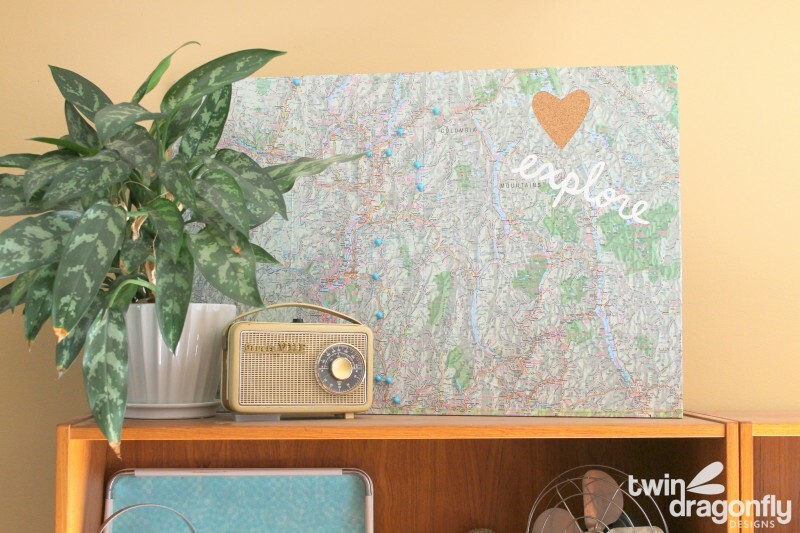 Apply the decoupage medium to the board with the foam brush and gently but firmly smooth the map over the board. It’s best to do this in sections as the glue dries quickly. Don’t worry too much about creases or wrinkles, they just add character to the map in my opinion *wink*. 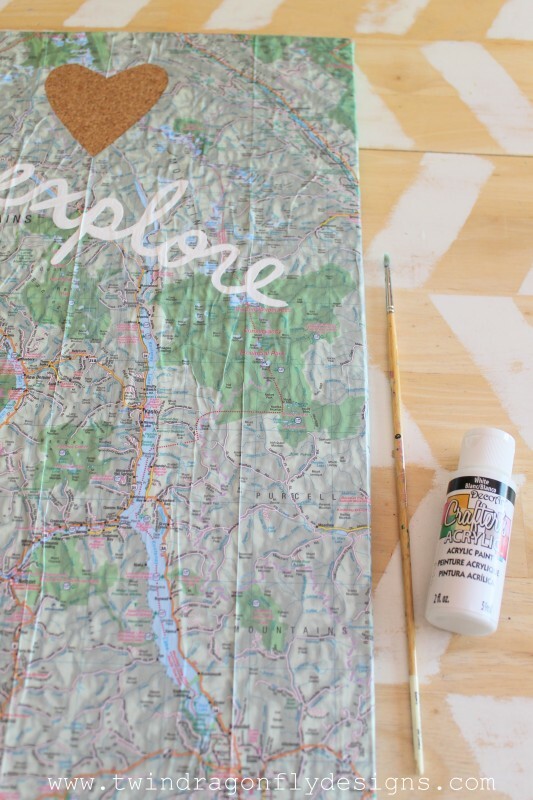 Step 3 – using the acrylic paint, paint the word “explore” under the heart in the top right section. Now cover the entire project with decoupage medium to seal the surface. 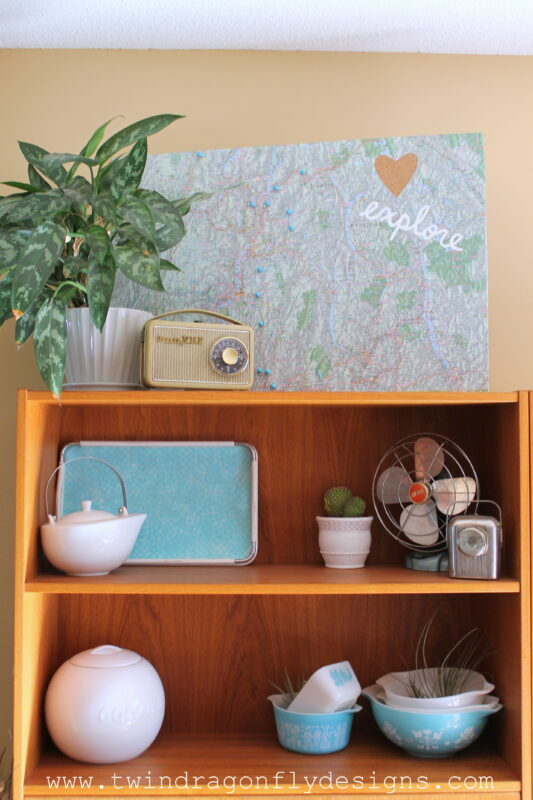 Step 4 – add push pins to each location that you and your family have travelled to. I added numbers to our push pins with a sharpie marker. I corresponded each number to a campsite that we had been at and wrote that information down in this handy, dandy note book! Now the kids can look up each location from the map and see where and when we were at a specific spot. 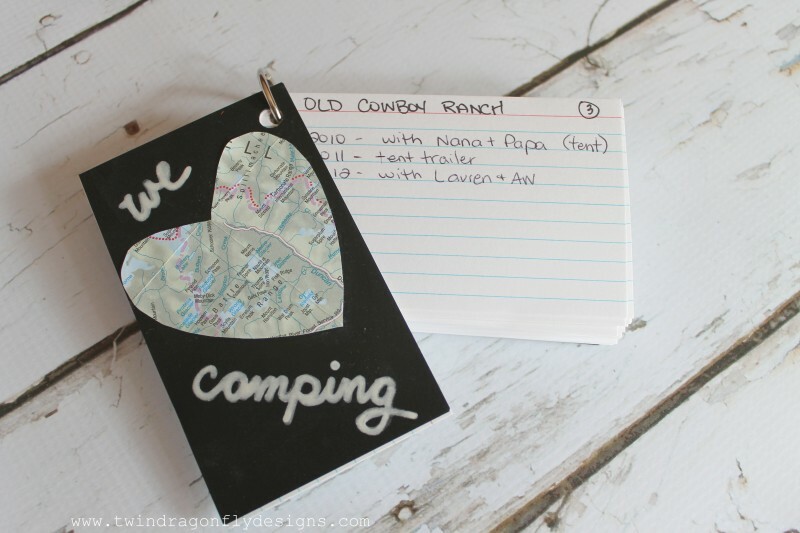 I used the heart that I had cut out from the map and a white paint pen to embellish our camping note book. Now we have a great visual way to showcase all of our family travels. 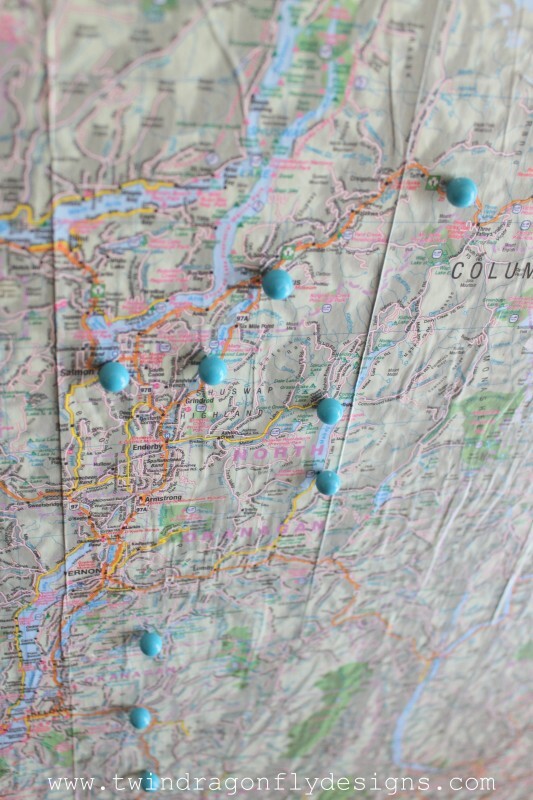 It was really fun to plot out where all of the push pins should go and Google a few locations for some of our older trips. The boys really loved helping with this! 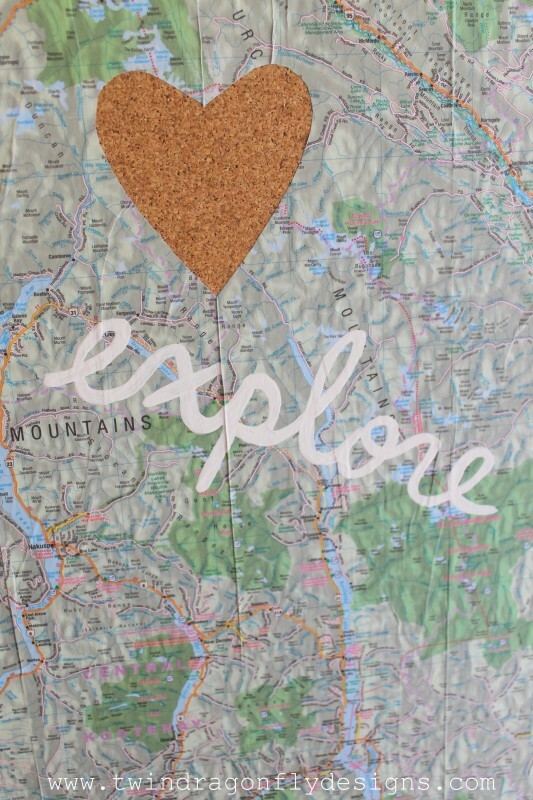 And truly we love to explore! How big would your map need to be? Would you plot road trips or travel across country? Where have you travelled to with the family? I would love to hear about your favortie destinations! Please share them in the comments. I am a member of the Elmer’s Crafty Parents Crew. This post has been sponsored by Elmer’s however all opinions are 100% my own. Heather this is adorable I love it! We are crazy about road trips, in fact we take as many as five or six a year, some are 1000+ miles and others are not more than 300-400 hundred. I can’t wait to do this project, its a fun way to see all the places you’ve traveled.